This is the third post in a series about Crossrail 2. The last post examined some of the flaws with the proposed scheme. This one focuses on small changes to the proposed scheme that would improve it. The final post will outline the larger changes that I really want to see. One of the key issues I identified with the proposed scheme is the over-reliance on Tottenham Court Road (TCR). It is used to both serve the entire West End, and provide a change to Crossrail 1 for the City and Canary Wharf. The safeguarded route wasn't quite as restricted to TCR, as it has provision for a station at Piccadilly Circus (to the SE of the current station between Haymarket and Oxendon Street). This option is retained in the proposed Metro scheme, but missed out in the Regional scheme that almost everyone is arguing for. I believe that the Regional scheme's over-reliance on TCR would be mitigated to some degree were an additional station provided in the West End. However, I don't believe that additional station should be at Piccadilly Circus where the safeguarding is. That location is too close to TCR and not far enough West. My proposed location is under the Green Park end of Jermyn Street. Due to the length of the Regional scheme trains, a double ended station is possible, however the distance between Green Park and Piccadilly Circus is just too great to link the two stations. Given that, I would argue that it should link to Green Park, rather than Piccadilly Circus, with the second exit near Air Street for Regent Street and Piccadilly Circus. This location is primarily about distributing passengers more evenly in the West End and beyond. In effect, it would act as Crossrail 2's equivalent to Bond Street. It would serve office locations in Mayfair, St James and the north end of Whitehall, as well as the major shopping and leisure areas. The link to Green Park is also very useful because it provides connections to tube lines. The Piccadilly line would provide access to South Kensington, Hammersmith and beyond While the Jubilee line provides access to Bond Street, Baker Street, Waterloo and London Bridge. This reduces the backlash in South West London, as Waterloo, Southwark and London Bridge would be relatively easily reached from Green Park, and in comparable journey times to today's service. Thus, this link would also reduce the pressure of passengers changing from Crossrail 2 to the Northern line at Tooting Broadway. The Jubilee line also provides resilience if Crossrail 1 fails, providing a second link to Canary Wharf. In addition, Green Park station is already modernized and step free, reducing costs. Map shows the TfL proposed route in orange and the deviation necessary to provide the many benefits of a station at Green Park / Jermyn Street. The harsh reality is that the needs of Battersea and the Vauxhall-Nine-Elms-Battersea area far outweigh the needs of Chelsea, particularly for a Regional type scheme. The residents of Chelsea neither want or have use for a Crossrail station at Kings Road. The vast majority will use a taxi or car. The residents of Battersea and Wandsworth are, however, starved of adequate public transport. Furthermore there are announced proposals for 20,000 new homes to be delivered within the next 10 years between Nine Elms and Wandsworth town centre plus numerous Embassies and ambassadorial staff moving into the same area. There are also multi-million square foot mixed use developments taking place at Battersea Power Station and Wandsworth Town Centre. Why then is Crossrail 2 proposed to go to Kings Road Chelsea where there is low demand when there is such massive demand growing to service a population undergoing rapid expansion along the South bank of the River? There should really be little doubt that an objective look at the case of the two locations would select Battersea Power station. The Northern line extension is useful for local transport, and heading East, but rather indirect for heading to the West End. Furthermore, there will be far more jobs created south of the river, as compared to the mainly residential areas of Chelsea. Those jobs are going to have commuters, and many will come from the South West area, making a stop there far more valuable than Chelsea. The split of the northern branches after Angel is plainly nonsense. It means that Hackney only gets 10tph (trains per hour), something which is ridiculously poor and a large under-use of the expensive tunnel. The simple solution (based on minimal change to the proposed scheme), would be to change the routing slightly. After Angel, take the line to Haggerston for the East London line instead of Dalston. Then via Hackney and Upper Clapton. Only then branch in two for Seven Sisters and Tottenham Hale. This provides the full 30tph to Haggerston (near Dalston), Hackney and Upper Clapton, without changing the split to the ultimate two branches in the North. 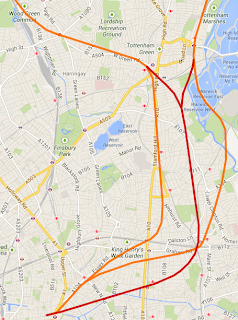 Map shows the TfL proposed route in orange and my simpler alternative in red. In the spirit of minimal change to the proposed scheme, there is a way to tackle the problems of service to Earlsfield - the Northern line. The concept would be to extend the Northern line from Battersea Power station to Wimbledon. This would involve a new tunnel from the power station, via either Battersea Park Road or Lavender Hill and Clapham Junction, surfacing in time to take over the two slow lines through Earlsfield to Wimbledon. This is not a cheap change, as it requires a new tunnel, but it would provide Earlsfield with a frequent service, even if not quite as fast as today. Since the faster route to central London from Wimbledon would be Crossrail 2, it should be the case that such a Northern line extension would not be overloaded. This would particularly be the case if Crossrail 2 goes via Battersea power station as argued above. It may be possible to continue the Northern line to St Helier on the Sutton route. This would allow the Northern line trains to reach the Morden depot. The remainder of the route to Sutton could then be converted to a tram. This post has outlined four small scale changes to the proposed scheme that would have a big impact on its ability to deliver. The key item is the additional central station at Green Park / Jermyn Street. It has multiple advantages, including spreading the load in the West End, provides resilience and additional job market access via the Jubilee line, and avoiding the need for most changes from Crossrail 2 to the Northern line at Tooting Broadway. 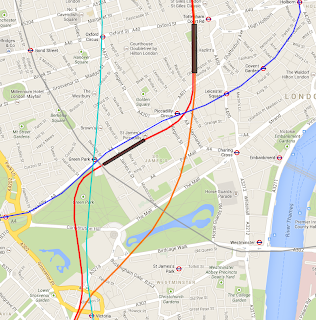 If you have any other small changes to Crossrail 2 you'd like to suggest, add a comment! I agree, junction after Clapton would make so much more sense, TFL's proposal is wasting so much opprtunity to connect an abundant source of housing in Hackney. Hackney is also the only London Borough without the Underground and there are no plans for it in the future which is plain pathetic. Some people had asked for a station in Stoke Newington which again makes loads of sense considering is is exactly between Dalston and Seven Sisters (try walking to either of these stations from Stockey, it'll take you an hour). The developers said it would be under-used and would slow down the service, again they have no idea how many people live in the area, struggling to go to work everyday.